We are very sorry to inform that Yahoo Finance have discontinued their API for exchange rates. For Callista Currency Converter, this means that no new rates can be downloaded from Yahoo. The last downloaded rates will be used as long as Yahoo is your selected provider of rates. Exchange rates from ECB will continue to work as before, but unfortunately only 36 currencies are offered by ECB. ECB can be selected as rates provider in Settings. We are looking into the problem and are trying to find another trustworthy supplier of exchange rates. For the moment, we have no estimation on when this can be achieved. 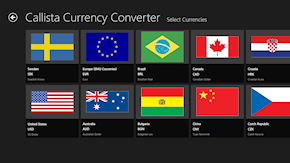 Callista Currency Converter is possibly the most convenient and reliable currency converter around, and it is free! 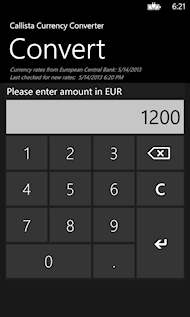 Just enter an amount, press return, and the amount will be converted to all the currencies you have selected. 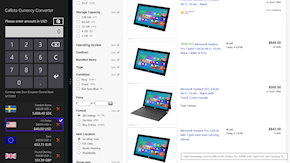 Use it full screen for easy access when you are travelling or use it snapped when you are browsing foreign web sites and quickly need to convert amounts to your currency. Converts between the 68 most commonly used world currencies. AED, ARS, AUD,BAM, BDT, BGN, BRL, BYR, BZD, CAD, CHF, CLP, CNY, COP, CRC, CZK, DKK, DOP, DZD, EGP, EUR, FJD, GBP, GTQ, HKD, HRK, HUF, IDR, ILS, INR, IQD, IRR, ISK, JMD, JOD, JPY, KES, KRW, KWD, KZT, LTL, LYD, MAD, MXN, MYR, NGN, NOK, NZD, PAB, PEN, PHP, PKR, PLN, RON, RSD, RUB, SAR, SEK, SGD, THB, TND, TRY, TWD, UAH, USD, VEF, VND and ZAR. 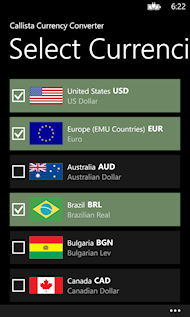 Additionally any of the supported currencies can be converted to and from Bitcoin. Converts to all selected currencies at once. Let’s you select your preferred exchange rate provider: Yahoo Finance or European Central Bank. 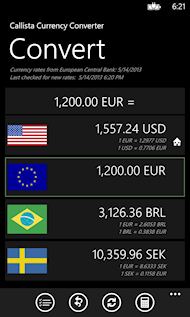 Downloads the latest exchange rates automatically. Works offline by using the last downloaded exchange rates. Configure a percent value that matches the fee most of us are charged by our bank or card companies on every exchange transaction. 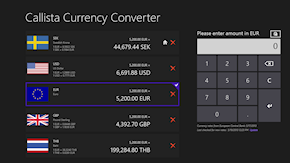 The Callista Currency converter uses your internet connection to download exchange rates from the provider you select. It does not collect, transmit or upload any information.